Irrigation water used to grow grain crops, vegetables, horticulture crops, pastures, trees and any agricultural product comes from a variety of sources. All irrigation water contains dissolved mineral salts with the concentration and composition being determined by the particular water resource used. Water in streams from snowbound mountain tops contain very small amounts of salt whereas water within the Orange River irrigation and other schemes are high in salt levels. Groundwater used under centre pivot irrigation would vary according to the soil type and underlying rock formations. Too much salt can reduce crop production and water infiltration on soils that have been irrigated for 20 years or more. Too little salt can also result in a chemically compacted soil. The level of sodium (Na) in a soil can result in soil particles or even layers of differing soil profiles forming a compacted layer that the roots do not penetrate. A seemingly very deep potentially productive soil over time has more runoff from overhead irrigation and limited root development resulting in declining yields over the years. 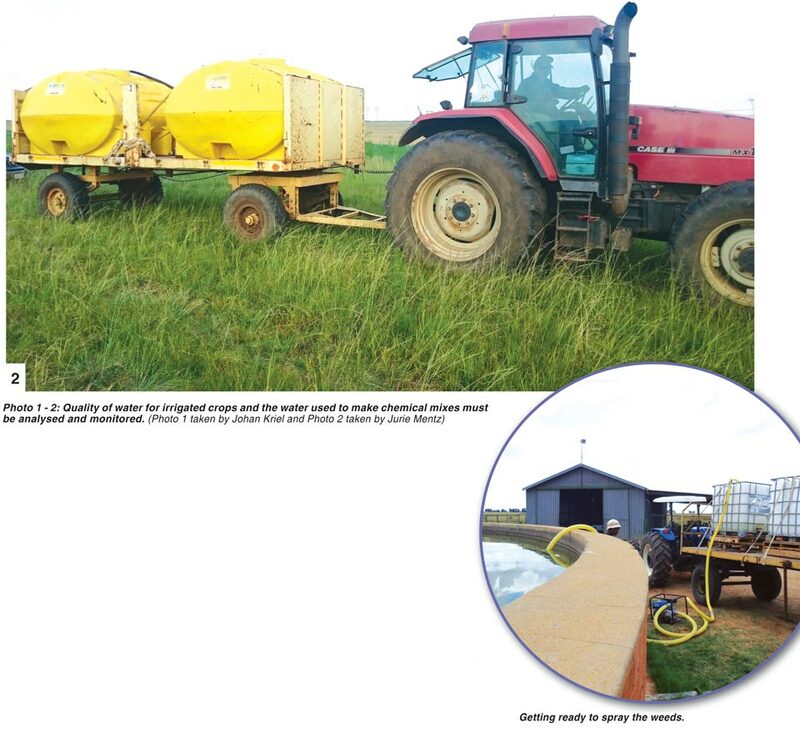 The same water from a particular source is usually used to mix the tank fills of herbicides and insecticides that will be used to control weeds and pests on the specific crop being grown. Fertigation of crops under irrigation is a common accepted and well proven practice. 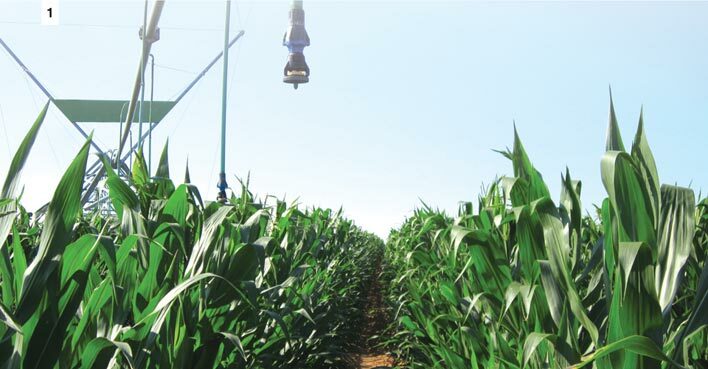 Especially the application of nitrogen to high yielding maize, wheat and other grain crops. The volume of water going through a pivot or ground sprinkler system makes it difficult to calibrate and mix crop chemicals accurately and these are best sprayed by tractor and spray rig or in the case of centre pivots put through a separate line mounted on the main irrigation pipes or framework on the pivot structure. The quality of water and dissolved salt content and pH can have a drastic effect on the working of the dissolved crop herbicides or insecticides. Both the quality of water for the irrigated crop and the water used to make chemical mixes must be analysed and monitored. Contact the Department of Water Affairs, your local Department of Agriculture offices, or universities doing groundwater or irrigation water analysis and other water testing labs. The test results can then be compared to acceptable norms and a management plan created to minimise the effects of the water that you are going to use. The natural weathering of rocks and soils results in salts being removed from a wide source and concentrated in rivers, dams and underground water resources. The dissolved salts in irrigation water are made up of positively (+) charged cations and negatively charged (-) anions charged. These molecules are attracted to each other and can be tightly or loosely bound to form salts. The most common salts in irrigation water are table salt (sodium chloride), gypsum (calcium sulphate) epsom salts (magnesium sulphate), baking soda (sodium bicarbonate). The most common cations (+) are calcium, magnesium, and sodium while the most common anions are chloride, sulphates and bicarbonate. The ration of these ions vary from one water source to the other. The total salt concentration or total dissolved solids or TDS for short characterises the salinity or irrigation water. The test result will show you the TDS expressed in milligrams of slat per litre or mg/L or parts per million (ppm) per litre which is the same number as TDS. The higher this number the TDS the higher is the salinity of water. The other main measure of salinity is electrical conductivity or EC. This can be measured very easily by farm managers or irrigators in the field. This is a very technical subject and your test must be compared to various norms. The water tests can be used together with your soil test to be able to identify the crop potential of a particular land under irrigation and monitor the build-up of salts in the soil over a long period. The solution may lie in applying more water to the land than can be held by the crop in the root zone so that excess salinity can be removed or leached from the soil profile. The proposed solutions must be carefully evaluated for possible financial gain and cost from a particular strategy and experts in this field must be consulted beforehand. Crops and crop cultivars with differing salt tolerances can also be evaluated and those with a higher salt tolerance can be chosen for planting. The calcium (Ca) content from various water sources will determine whether or not water is classified as hard, intermediate or soft. Hard water will have the highest level of calcium. The pH or acidity of the water has an influence on the chemicals mixed therein as well as the buffering capacity of the water being used. In simple terms the buffering capacity is the ability of the water to absorb increasing amounts of chemicals before there is a drastic change in pH which in turn is a measure of the number of available hydrogen ions in the mix. Neutral pH is measured at 7 and acid solutions are less than 7 with alkaline solutions being greater than 7. Again you can use your water test to evaluate the particular additives that must be used to alter the pH if too high or too low. Each different herbicide or insecticide has been evaluated for its highest effectiveness in a number of differing pH and hardness or calcium levels in a particular water source. The subject is very technical and only chemical consultants with experience in a particular farming area and who are up to date with their examinations or evaluations with the use of new chemical combinations and water quality adjustment prior to spraying should be consulted. A pH meter can be purchased inexpensively and be on hand to give you a quick reading on tank mixes using either dam water or clean borehole water. Remember that water with a high clay content will absorb the herbicide or insecticide chemicals and effectively neutralise their ability to enter plant leaves or stems, kill problem weeds, insects or funguses. The addition of excessive buffers and other additives can adversely affect the pH. Measure before and after tank mixes have been made just to check. When mixing various chemicals, buffers and other additives the following order of mixing should be followed to ensure maximum effectiveness of the spray mix. Fill the tank with 60% - 80% of required and treated water followed by conditioners or acidifiers, wettable or dispersible powders, water dispersible granules, dry flowable suspension concentrates, wetter, emulsifiable concentrates, water soluble concentrates, adjuvants, liquid UAN and finish with the remaining volume of water required. Use the test of your water quality to monitor the impact on your soils and salinity as well to mix the correct additives and chemicals to ensure that the spray mixes work correctly to control weeds and insects as intended.